The Gods and the Amazons are some of the more interesting aspects of DC lore, and it is from that well that Darkseid War gets its origins from. For such a far-flung and epic storyline, the beginnings are pleasantly intimate, really coming down to a tale of a mother and a daughter rebelling against their father. The father just happens to be Darkseid, one of the most powerful entities on the planet. Be the difference between hungry and well-fed. In fact, many of the relationships on display throughout are parental, as Geoff Johns guides us through life as a son or daughter through numerous characters eyes. Wonder Woman, Grail, Kalibak, and Mr. Miracle all anchor the story, showing what someone can be because of and in spite of their childhood circumstances. Johns also manages to streamline the convoluted history of the New Gods and Apokolopis into something digestible for old and new readers alike, which has become his calling card. For as much empathy as the writer elicits for Mr. Miracle, a character I never really cared about, he elicits the same amount of animosity for Metron, the knowitall with the big chair. We'll just call him blue chair from here on out. Blue chair is a giant tool and is ready to manipulate someone at a moments notice. He says it's for the betterment of the universe or some such, but I don't believe him. He makes The Watcher seem like someone you'd like to go have a beer with. Okay, back to the story, though blue chair does have an important role to play. Grail, who is revealed to be the daughter of Darkseid and the amazonian assassin Myrina, is helping her mother to take down their father, with the help of another DC big gun, the Anti-Monitor. Again, Johns is actually able to boil this character down from his immense convoluted past into something that makes some sense, and his motivations are simple. He's tired of doing his job, and he wants out. The battle itself is very much secondary, at least in part one, though I did have an issue with Batman being taken out so quickly (before his role as blue chair). It's like 3 hits and then he's done. The goal of the book seemed less about that conflict and more about getting the league into their new "godlike" roles, so that may bother some looking for a slugfest. The whole Luthor and Superman subplot felt more like a plot device to get Superman into his new form rather than an integral part of the story, but maybe that will all come to fruition in part 2. 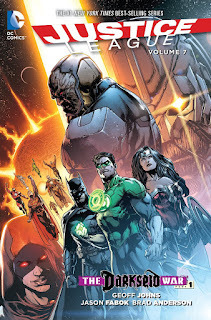 The book is helped by a fantastic art team, including Jason Fabok, Kevin Maguire, Phil Jimenez, Dan Jurgens, Jerry Ordway, Scott Kolins, Jim Lee, and Scott Williams, and it certainly doesn't disappoint. The character design for Grail and the Anti-Monitor also deserve some praise. I was never a fan of the big blue helmet and orange armor, making him look more like a Mega Man villain than a universe-threatening powerhouse, and this look is a step in the right direction. It could use a bit more color to help it pop more, but I like the way it's heading. Grail looks like her upbringing, with Amazonian and Apokolips traits displayed in her costume. The art team really knocked it out of the park. For those looking for a jumping on point, this is actually not a bad place to start. Things will confuse you, especially if you haven't read a DC comic in awhile, such as Jessica Cruz's role in this, or some of the dynamics between Superman and Luthor, but overall there is a great deal to like in volume 1, and I'm looking forward to reading volume 2. Not only did Jason Fabok do an amazing job in Darkseid War, but I'm very excited to see his work on the new Justice League vs Suicide Squad weekly mini coming up next month. Also, can't help but post this image proving beyond the shadow of a doubt that Zenescope -completely- ripped off the Grail design for their newer character Hellchild, which debuted a few months after Grail.